In the fall of 2016, CWRI surveyed private firms to gather information about hiring demand for use by job seekers, employers and policymakers. These data, gleaned directly from Maine employers, provide a unique snapshot of the recent job market: the number and types of jobs available and their characteristics. The Job Vacancy Survey (JVS) provides a snapshot of employer demand in the reference month of September. The survey methodology is designed to yield estimates of vacancies for sub-state regions. Series break in 2016. Significant changes in methodology were implemented in 2016. The sample design was simplified, reducing the number of geographical regions from five to three, and stratifying by sixteen industry sectors rather than by eighty-one detailed industry classifications. These changes in survey design make comparisons of 2016 results to the results of prior surveys problematic. 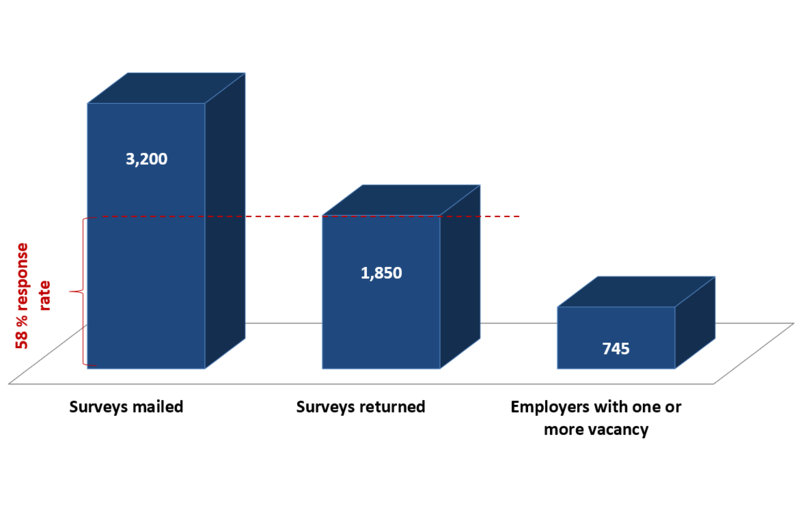 Top level statistics show a significant increase in the number of vacancies (30,860 in 2016) and the corresponding statewide vacancy rate (6%) in 2016 compared to 2015 (22,357 and 4%, respectively). It is unclear how much of this increase is attributable to increased employer demand and how much is attributable to a change in survey design. For this reason, we discourage comparison of these results with prior JVS results. Surveyed to discover what jobs were open and actively recruited for in the target month. Surveys were mailed and responses were accepted by mail, online, by fax, email or telephone. View survey form. To determine directly from employers what positions were in demand. Employers fall into three sizes classes, each representing about one-third of Maine jobs. "Industry" describes the economic activity of employers. Survey responses are grouped according to industry sector: broad categories of firms engaged in diverse but related activities. The 2016 JVS had a response rate of 58 percent. Forty percent of these indicated one or more job vacancy. In sum, 30,860 job vacancies represents a statewide job vacancy rate of 6.2 percent, or 6 job openings per 100 jobs. *Percentage difficult-to-fill is share who responded “yes” divided by all those who responded “yes” or “no”.